*** Creeping line option – use mouse cursor to make speed slow *** 18 February news. Greetings, Heroes 4 players! We are glad to inform that 1/2 Playoff started! *** Current games of 1/2: M8mat (Stronghold) vs Camoes (Preserve) on Spleen, Gustn vs Jel start 19-20 february *** Games of 1/2 will finish 04 March *** Good luck and Have fun! Coordinator functions: coordination and interrelation maintenance between the executor, organizers, judges and technical managers of tournaments. Executor functions: system engineering of tournaments and a toss-up; controlling tour deadlines; summarizing of rounds and tournaments; the notification to participants and judges about competition news by e-mail; granting to organizers of the information for the publication on their sites and forums; creation of networks Hamachi; the help to participants of tournament (consultation, solving of the time mismatch problems and debug in game); decision-making concerning a failure of terms of round by players etc. · M8mat – Archangelcastle froum (e-mail: m8mat@hotmail.com). Organizers functions: discussion of organizational questions of tournament with the executor; representation of player’s interests of their sites and forums in tournaments; the publication of the information given by the executor at a forum of the resource. · Zybr – HeroesWorld (e-mail: shineheart@yandex.ru). Judges functions: Functions of judges: the permission of difficult game situations (check saves, acceptance solution in disputable situations) and consideration of appeals. Decisions of judges during carrying out of tournaments are not subject to contest. Technical managers functions: technical control of sites work. Info and tech sponsors functions: publication of the tournament news and important info, supporting all necessary software and website, mailboxes support. Game version — Heroes IV Equilibris 3.51. Any other game modifications are prohibited. Recommended network software: Hamachi, GameSpy or direct TCP/IP connect. All players have to log into according hamachi network or gamespy to give all referees an universal ability to connect to each player or control each player activity. It is recommended to use ICQ or MSN to communicate to each other (forum messages or e-mail will have less importance against instant messengers if any argue is present). Games of World Championship 2010 will be played on the maps which have been selected by players at the organization «World Championship 2009 tournament series». World Championship 2010 has structure classical Playoff. Dimension of a grid depends on quantity of the registered players. December, 17th: opening of the registration of championship. December, 22th: publication of the material of the championship (regulations, maps, the software). January, 02nd: closing of the registration, publication of the results of toss-up. January, 03rd: the championship start. First player (in the pair, hosting player) is responsible for the game. First player should notify referees about opponent’s absence (not less than 5 days until current round ends). Host player will get technical lose if there was no notifications and explanations about broken game. Also host can get tech lose for modified maps using or maps, that doesn’t exist in tournament maps set. Such maps can be used only after referee’s permission (all gameplay advances should be discussed with referees). If any difficult situation present, then referees have to solve it (using voting if there is no unanimous decision). Rules of competitions of «World Championship 2009 tournament series» are used at the organization. Game version is НoММ4: Equilibris 3.51. The tournament games are playing by means of program Hamachi in networks, which created by the executor at the moment of start of tournament. 4. All games questions resolve judges of tournaments. 5.4. By an alphabetic order. 6. Email notification will be sent to each player before next round starts (using registration email). Host player should plan a game with his or her opponent. Host player should contact referees if his or her opponent is not available. CMEPTb (Haven) def. ANL (Asylum) — Circle of Life, 125. It's strongly recommended to use following settings. But these settings could be changed if both opponents agreed. It is prohibited to use modified map copies. Host player will get tech lose for that. Upper players in playoff pair is the first player and he or she will be the host. If this player isn't able to host then he or she has to inform referees before the championship starts. 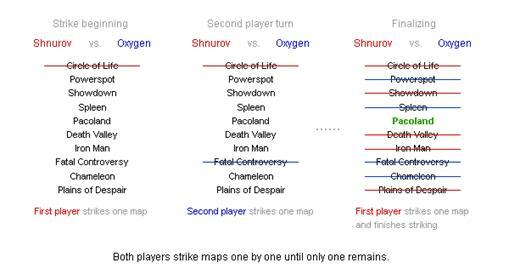 Map for the game should be selected using following way: both players strike out maps from the full map list one by one until only one map remains (map for your game). First player begins striking. 4. Opponents have to decide about game settings after map selecting (timelimit, guards type and game difficulty). If there is no agreement in players opinion then common settings should be used (p. 2.1). After that second player chooses starting position (color). Any player can play for random alignment instead of choosing. First player should say if he will play for random alignment or not (second player after that). If one player chooses random and second chooses custom alignment then player, who uses random strikes out two of allowed alignments for other player. Opponent has to choose alignment from the remainders. 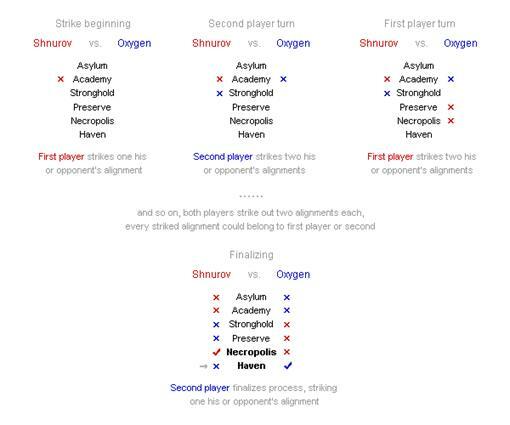 If both players choose to play for custom alignments then striking should be performed by the following way: second player begins striking from all alignments for both players (12 alignments, if 6 alignments are allowed on a map). Then both players strike out alignments until only one will remain for each player. Striking consecution is: 1-2-2-…-2-1 (this means second player strikes one alignment, then first — 2 and so on). Check image below to examine how should it go. timelimit and difficulty — custom (if there was an agreement) or common from map list. Host player starts a game after his or her opponent joins and both players set their alignments. 1. «in» — obligatory message for guest player after successful joining the game. 2. «restart» — obligatory message when asking for restart. 3. «k» — shorten «ok» — obligatory answer for «in» or «restart». 4. «s» — shorten «sent» — obligatory message when pressed end turn button. 5. «r» — shorten «received» — optional message about turn receiving (better say first two times to check connection). Both players can take restart until the first turn ends (pressing end turn button is the and of turn, you cannot restart after that). You have to write «restart» in a game chat and wait for an answer. Then host should create game with the same settings. Standart victory conditions are enabled (losing all towns and armies or losing all towns for 3 days means defeat). Bugs using is prohibited. If you don't know if any action is a bug or not then ask referee for help. Any player will get technical defeat after bugs using. Any long game could be stopped by the referee. In this case final battle should be destined and played. It is prohibited to play too long battles (battles, which severely increase overall game length). Any player can send a complaint to any referee for a lot of opponent's delays. Such compliant should contain saves. For example: 1 sprite vs. 100 ogres, such battles will be won anyway but too long. ATTENTION: This rule doesn't concern of player vs. player battles. There could be a stalemate situation during player vs. player battles. For example: 10 imps vs. 100 zombies. Nobody can win such battle. Then attacker should retreat or surrender. If Shackles of War is present then this battle should be finished in autocombat mode. It's strongly recommended to make every day saves to have arguments if any questions will follow. Also it is desirable for the attacking player to do saves in fights with the contender to avoid the disputable situations of connection failed. 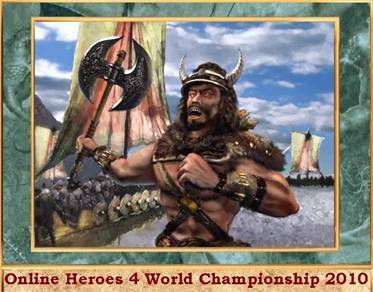 Tournament purpose is definition of the strongest player Heroes of might and magic 4.